For feedback, questions and suggestions, please send us	email . 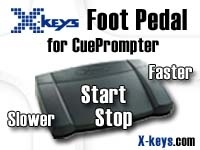 CuePrompter is a free teleprompter/autocue service. Your browser works like a teleprompter -no extra software needed. Free for any use (both commercial and non-commercial). Bookmark this site and come again when ever you need teleprompter services. works well with most browsers and operating systems. In Windows machines Google Chrome and MS Internet Explorer seem	to work better than Firefox. reverse mirror display (method 1) : download and install Strait Kcab -font. Then tick "Mirrored" option before	launching the prompter window. reverse mirror (method 2, only IE browser) Kcab font is not needed. You may need to change your browsers security settings. First add http://www.cueprompter.com/prompter.php as a "Trusted zone" in your computer (none-https). Then allow active content to be displayed on your computer (in trusted zone). Select the "mirrored" option from prompter window. Disclaimer: Use this service at your own risk. Write or cut and paste your script to the form below. Press the button to start the prompter. If text needs editing, just close the prompter window and restart with the new script.